Whitacre Greer utilizes the dry-pressed manufacturing process in its production of clay paving brick and fire brick. Historically, dry-pressed manufacturing was common. In fact, many brick buildings constructed in the early years of the twentieth century were built with dry-pressed brick. Today there are just a handful of manufacturers dry-pressing brick and most are using the process for refractory brick only. 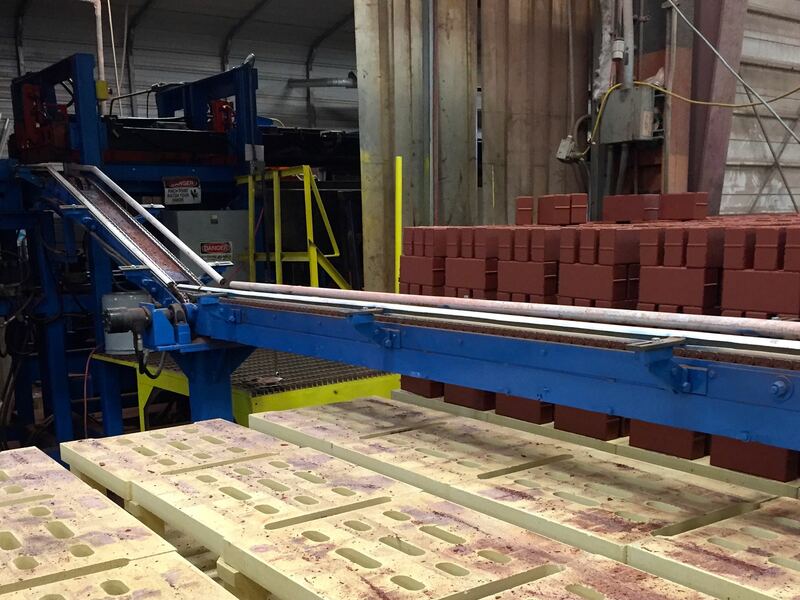 Whitacre Greer is one of two known organizations in North America dry-pressing a decorative brick. Dry-pressed brick-making uses the same clays and shales used in other brick production processes. 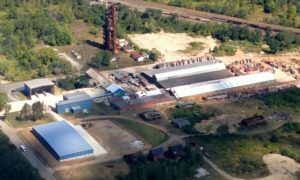 Whitacre Greer sources its raw material from several locations around northeastern Ohio. On a daily basis raw material is trucked into Whitacre Greer’s Alliance, Ohio facility and placed in queue for immediate use or in storage for future use. In the photo below, raw material is housed in the two left-most buildings. Shale and clay are the two primary raw materials used by Whitacre Greer. As they are extracted from the ground, the two materials look very similar. Once fired, their unique qualities are apparent. Shale, having a higher iron content, takes on a nice red color once fired or baked in the kiln. Clay, on the other hand, fires to a white or buff color. By mixing these two materials in varying proportions and with the addition of small quantities of other additives, Whitacre Greer is achieves a wide range of colors from traditional reds to contemporary buffs and grays. When needed for production, raw materials are transported via front end loader to the grinding facility where the material is processed through a series of screens and impact crusher into a material having the consistency of course powered sugar. Conveyor belts move the refined material into a series of holding bins adjacent to the production floor in anticipation of production. A programmable logic controller automates the mixing of raw materials and additives and sends it to one of five presses. Mechanical-type presses produce between two to four pieces with each stroke. The presses use steel molds and feature a vacuum system to extract air from the molds as the press closes. This results in a more dense green or unfired brick. 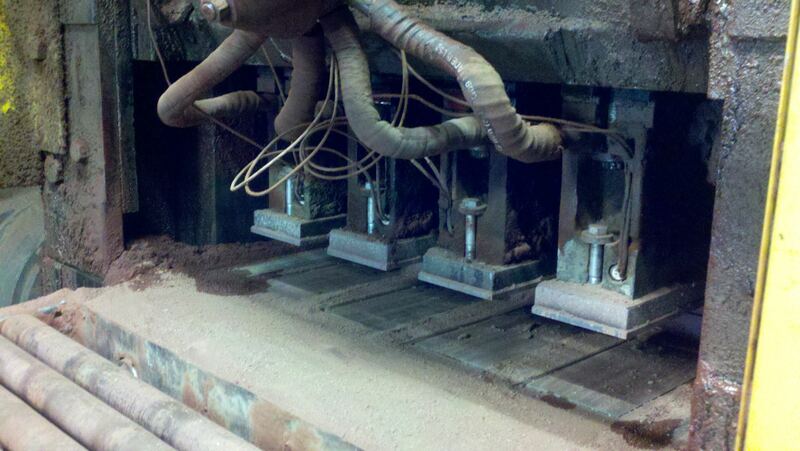 The press pictured to the right is configured to produce four 4 x 8 clay pavers with each stroke. Unfired brick exit the presses on rollers or conveyors and are loaded onto kiln cars by press operators. The press operators also perform the first of many quality inspections in the production process. Here’s a video of the press in action! The small coiled lines are wires powering heaters that heat the top and bottom pads of the molds. Heat helps the material release from the molds without sticking. Light curtains protect the operator from press pinch points. Green, unfired clay pavers are nearly identical in appearance, regardless of the desired end color. Shade 30 Clear R ed Truncated Dome ADA pavers are shown in the photo to the left. the kiln where it will be fired or baked at 2000 degrees Fahrenheit. The firing process enacts a thermo-physical change in the material yielding a brick with strength and beautiful color. The next step in the manufacturing process is firing. Firing is a two-step process. First, excess moisture must be driven from the green brick in the dryer. Second, the brick must be fired in a closely controlled kiln. The result is a durable and attractive clay paver or fire brick. In their unfired state, dry-pressed pavers contain between 4 to 6 percent moisture. That moisture must be removed from the brick before firing or it will cause the brick to crack. Dryers using waste heat from the kiln are used to accomplish this task. Excess heat from the kiln is piped into the dryers and agitated with a series of fans. The resulting temperature and air movement removes the moisture from the brick, readying the product for the kiln. Green brick are first placed in one of three dryers where they are dried for approximately two to three days. From there they are placed in one of two kilns. Whitacre Greer’s primary kiln is pictured below. The 4 x 8 clay pavers shown below are shade 30 Clear Red, the same color as the unfired green ADA Truncated Dome pavers pictured above. The heat of the kiln is responsible for the color change in the manufacturing process. The kilns are natural gas-fired and closely controlled to elevate the temperature of the green brick according to a predetermine schedule. Too fast or too slow of an increase and cool down can result in an unacceptable finished product. The elevated temperature of the kiln gives Whitacre Greer clay pavers and fire brick their strength and rich color. Exiting the kiln, the bricks cool until they can be comfortably handled by the unloading and packaging crew. Pavers are manually removed from the kiln cars and placed into the packaging machine. This operation can be seen to the left. The packaging machine applies a penetrating-type sealer to all sides of the paver for enhanced efflorescence and stain protection and then packages the material on wooden pallets. 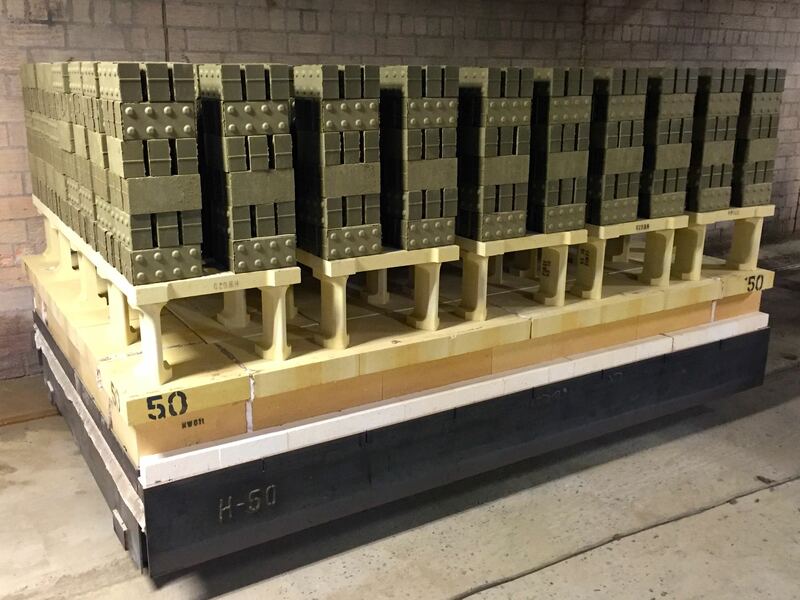 Fire brick are placed directly on pallets, wrapped and banded, and placed in storage for shipping. Whitacre Greer clay pavers are shipped in straight-shade pallets or may be blended at the plant to a design professionals specification. Blending at the plant of two or more standard colors allows the project designer to select the perfect range of colors for the space. Clay pavers and fire brick may also be tumbled for an old world cobbled aesthetic. 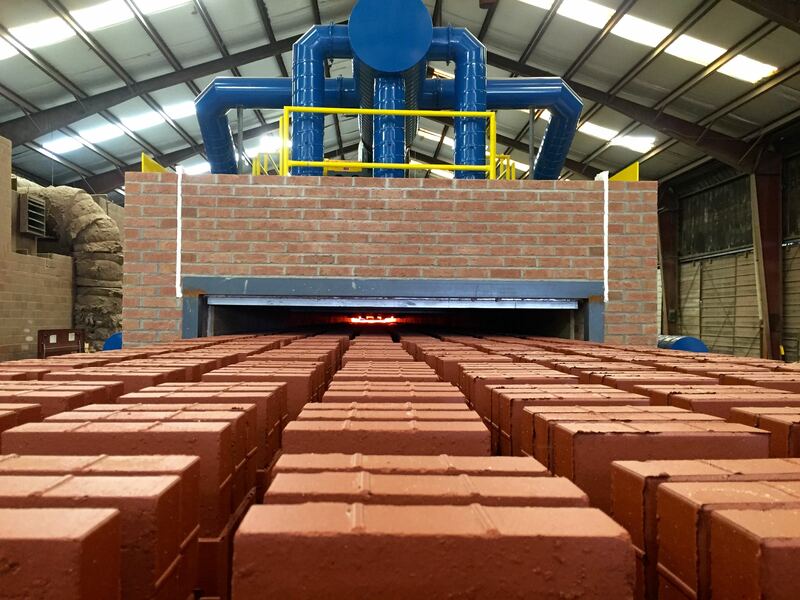 Additional information on the brick manufacturing process, including the dry-pressed method, is available from the Brick Industry Association in its Technical Note 9 Manufacturing of Brick. Click here to view the Technical Note.